I’ve made chicken pot pie what seems like hundreds of times, and I’ve also made it every way you can think of. I’ve mastered it classically, with a flaky top and bottom crust, with huge chunks of lobster and pearl onions, and lightened up with phyllo dough and low-fat milk, to name a few. But I have to admit, today’s Cheesy Chicken Pot Pie with Cheddar Chive Biscuits is the best version I’ve ever made, and honestly, the best I’ve tasted, period. While this version doesn’t stray too far from the classic, I added an extra layer of flavor in the filling with my favorite way to make dishes a little bit more elegant – dry sherry. 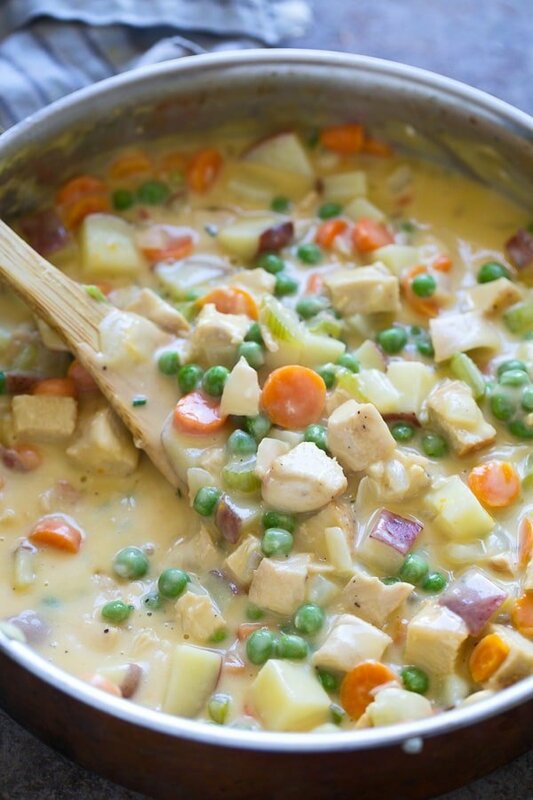 It adds this sweet, almost luxurious taste that I can’t get enough of when it’s laced with creamy sauce, veggies and perfectly cooked chicken. Also, instead of a crispy pie crust for the top layer, I whipped up the flakiest, cheesiest, most delicious cheddar chive biscuits, which are nestled right on top of the filling. Coincidentally enough, they also happen to be one of the best biscuit recipes I’ve made as of late. It was a good day in my kitchen, to say the least. So the filling begins by sweating out the onion, carrot, celery and diced potato in a little bit of butter. Once the veggies are softened, a ¼ cup of flour is mixed in, and then the dry sherry, some chicken stock and whole milk are added in. The mixture comes to a boil, is reduced to a simmer and thickened, before adding in the diced chicken. 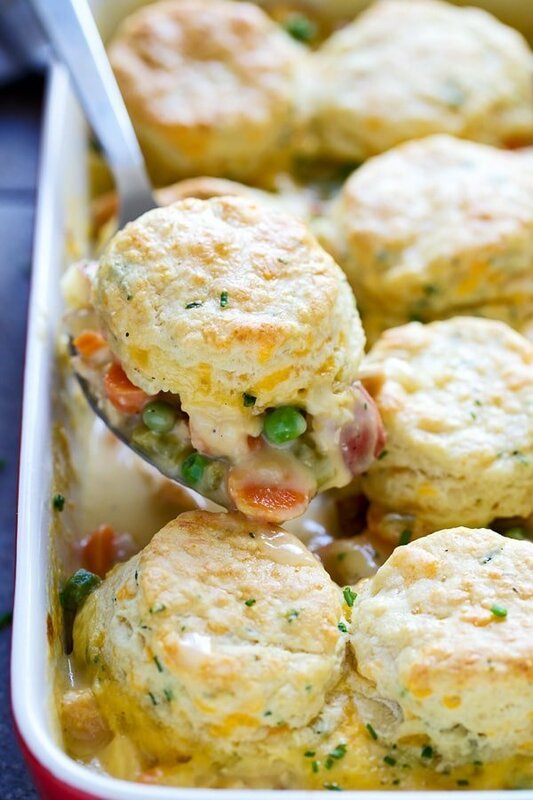 From there, the shredded cheese gets added in, and once it’s melted, the frozen peas go and it’s ready to be poured into a casserole dish and topped with the raw biscuits. Before we move on to the biscuits, I do want to note that while you could use a rostisseie chicken here, my thoughts were we’re already making everything from scratch, so you might as well cook up your own chicken breasts. So while the veggies cook, I halved a large chicken breast, seasoned it with plenty of salt and pepper and then seared it in a little bit of olive oil. I’ve always thought of myself as a pretty decent biscuit maker, but once I discovered the art of folding the dough over itself a few times before cutting the dough, my biscuits became exponentially better. This method actually kind of goes against what I’ve always believe about biscuits, that the less you handle them, the better they’ll be, but here, every time you roll out the dough and fold it over itself, you’re creating another layer of flakiness which in turn, makes the biscuits better. Another key component to making, tall and flaky biscuits is to make sure that when you’re cutting them, you take your cutter and go straight down forcefully and straight back up. Twisting or wiggling the cutter back and forth will destroy the height and symmetry of the biscuits. Oh! And one last thing, work with cold ingredients! The shortening doesn’t need to be cold, but the butter and buttermilk do. I actually like to cut my butter in to cubes, separate them and then place them back in the fridge while I measure the dry ingredients, whisk them and shred the cheese. Once the biscuits are formed, I pop them in the freezer for about 5 minutes before nestleing them on top of the chicken pot pie filling. They get brushed with egg wash, and then the whole dish is popped in the oven until the biscuits are golden brown and cooked. I like to garnish with a bit of chopped chive, and serve it straight from the casserole dish. 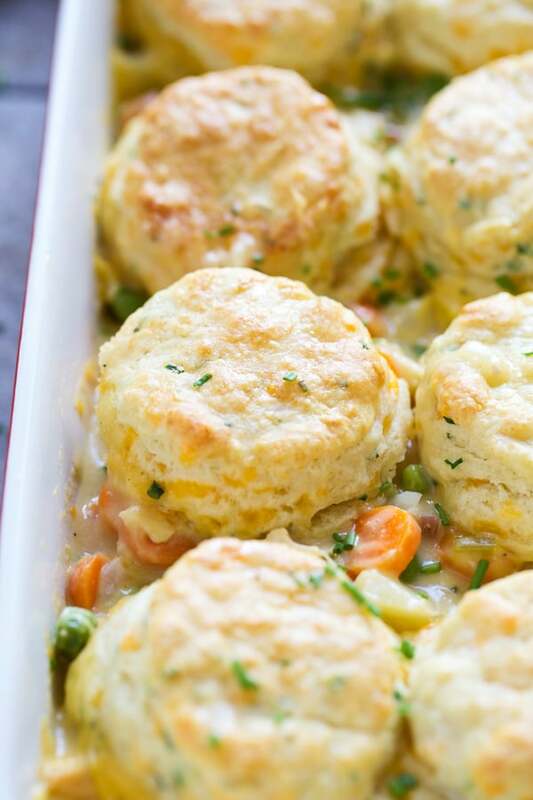 When you want fall + comfort, look no further than this Cheesy Chicken Pot Pie with Cheddar Chive Biscuits! 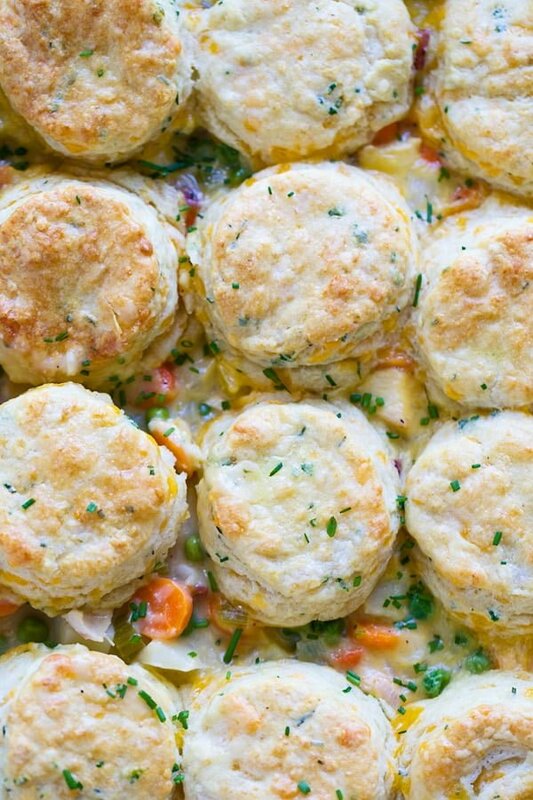 Literally the best chicken pot pie recipe EVER. (READ RECIPE AND NOTES BEFORE PREPARING!) Preheat oven to 400 degrees. Grease a 7x11 baking dish with non-stick spray or butter. Heat a large skillet to a medium heat. Add 3 tablespoons of butter. When butter melts, add chopped carrot, onion, potato, celery and 1 teaspoon salt. Sweat vegetables until softened, but still have a bite to them, about 8 minutes. Add flour to vegetables, cook for 1 minute. Add in sherry, chicken stock and milk. Quickly stir the liquid with the vegetables to make sure no lumps form. Once the flour, veggies and liquid are incorporating, bring the mixture up to a boil and then reduce to a simmer. Add chicken, toss and then simmer until thickened, about 3-4 minutes. Once thickened, turn the heat off and add cheese. Stir until cheese has completely melted. Add frozen peas, toss to coat. Season filling with salt and pepper. For my taste, I added about another 1/4-1/2 tsp salt. Keep in mind, every palate is different, so you may need less or more, taste before doing anything, then adjust! Continue to do so until it's to your liking. Transfer to prepared baking dish and top with biscuits. Brush with egg wash mixture. Bake in the oven for 15-17 minutes or until biscuits are golden brown and cooked through. Garnish with chopped chive. For the biscuits: I highly recommend making these while the veggies cook, then pop them in the freezer until the filling is complete. Whisk flour, baking powder, baking soda and salt together in a medium bowl. Add in chives and cheese. Stir with a fork to combine. Add in cubed butter and shortening. Use a pastry cutter or fork to cut the fat in to the flour mixture. It shouldn't take long, you want there to be small, pea-sized chunks of fat distributed throughout the flour. Once the fat is cut in, add half of the buttermilk. Use your fork to gently toss until evenly coated. Add the other half of the buttermilk and continue to stir until incorporated. DO NOT OVER MIX! Dump dough out on to a lightly floured surface and use a rolling pin to gently form it into a (approximately) 6x8 rectangle. Fold the dough in half over itself and roll into another rectangle the same size. Repeat two more times. On the last once roll, the dough out so it's about 1/4 inch inch tall. Use a 2 1/2-inch biscuit cutter to cut 12 biscuits. If needed, reform scraps of dough to make all 12. Make sure you don't twist the biscuit cutter into the dough, just go straight down forcefully and straight back up. To prevent the cutter from stick, dip in flour before you make each biscuit. 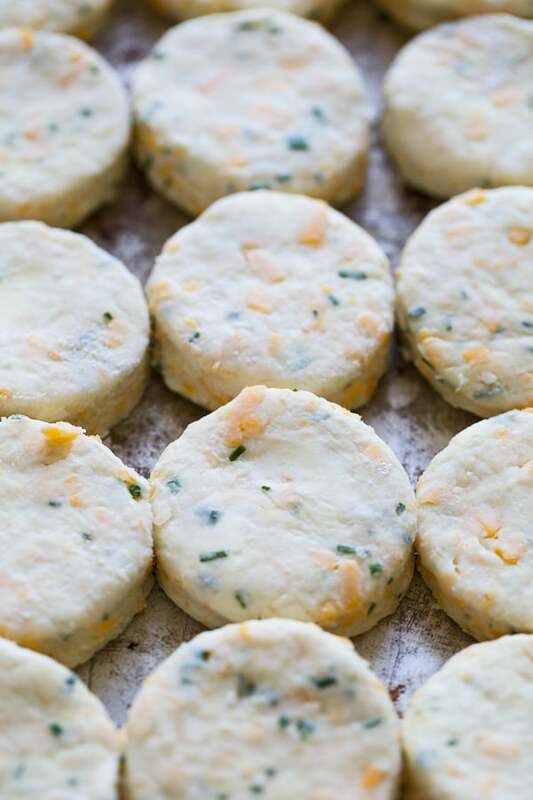 Place the biscuits on a small baking sheet and place in the freezer until the filling is complete. If using raw chicken to begin with and not leftover or rotisserie chicken, speed up the cooking process by cooking the chicken first. Split each breast in half lengthwise so you have four thinner portions, season with salt and pepper on both sides and sear in a non-stick skillet with a little bit of olive oil. Prep your veggies as it cooks. Also, while the vegetables cook, make your biscuits and then pop them in the freezer while you continue to make the filling. Utilizing idle time is the best way to efficiently make recipes! Also, keeping the biscuits in the freezer while everything else finishes up, ensures flaky biscuits! The serves four people, easy, and six conservative eaters. If your family has big eaters in it, I'd double the filling, but keep the biscuits the same. 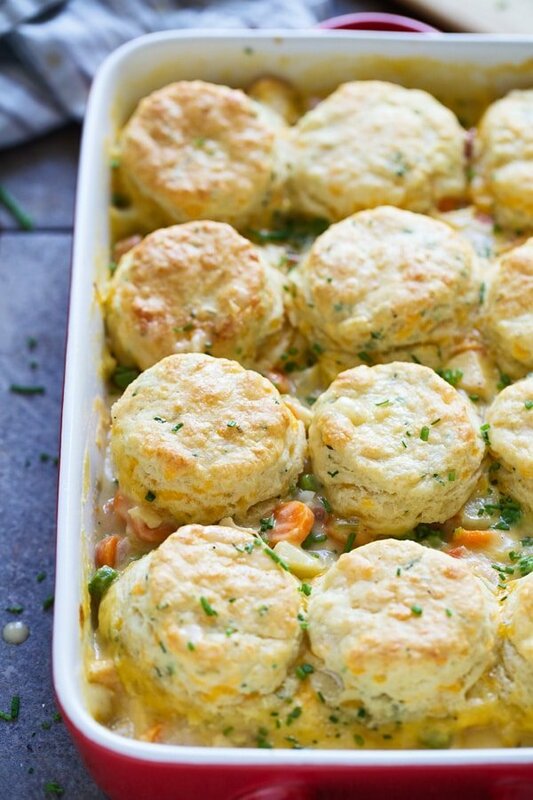 43 Responses to "Cheesy Chicken Pot Pie with Cheddar Chive Biscuits"
I haven’t tried but this looks scrumptious. Thank you! I’d love for you to comment back if you make it! There really truly is nothing better than a big ol helping of chicken pot pie. This looks FAB! 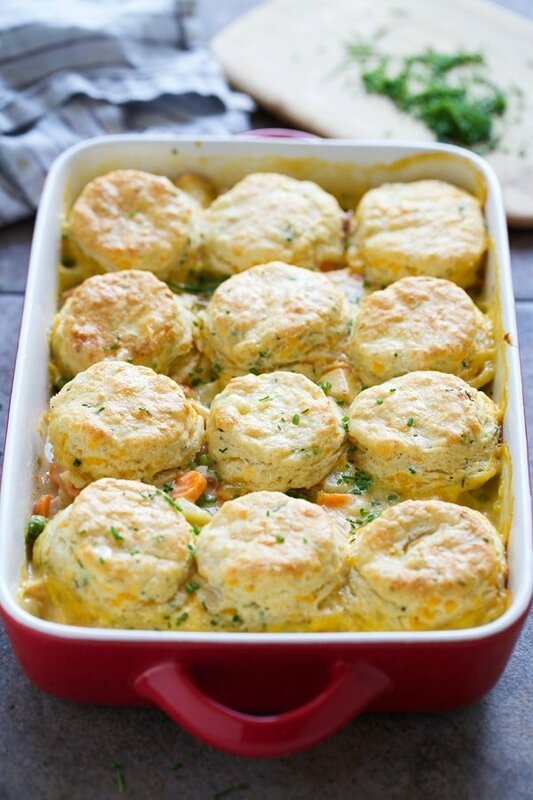 Cheddar biscuits as part of chicken pot pie?! Genius! How much salt is used in the biscuits? The instructions mention adding salt with the dry ingredients, but I don’t see the amount to use. This looks delicious and my family can’t wait to try it. Thanks so much for catching that! It’s one teaspoon of salt in the biscuits. Recipe updated! Also, let me know if you make it! Thanks for your prompt response. Cheesy Chicken is now on this week’s menu! This is a great dish. Everyone loves it and I’ve made it several times. Thanks so much Karen! My little one loved it! This looks so delicious! I love the ingredients you chose and how simple it looks so make. I’m definitely going to try it myself. One more question: What is the recommended baking temperature? Just served this to a group of 9 adults with the filling doubled! Good amount of food, served with a side salad. All the times for cooking the filling took a bit longer, which is to be expected. Used a 9 x 13 pan. I ended up with 20 biscuits, perhaps I could have rolled them out a bit thicker. Also had to add some cornstarch for the filling to thicken up, it had been going a while. Delicious! This was so delicious. Best pot pie I’ve ever had! My parents were visiting and all four of us eaters declared it a hit. This was my first time making biscuits too. I really appreciate the notes and tips, they were a big help! So glad you liked it Kelly!! Can this be made ahead? I bring casseroles to people once a week. If prepared a day in advance, will the biscuits be soggy? My mother-in-law actually just told me, this freezes beautifully. The biscuits may get a touch soggy, but they’ll still be delicious! YUM!!! Totally making this tomorrow. Perfect for the snowy days we’ve been having. I do have a question tho that I’m hoping you can answer, I don’t have dry sherry on hand. Is there anything else I can use instead? Hi Amy! So you can use white wine, or just omit it altogether! What can I substitute for dry sherry? Dry white wine or omit altogether! Third time making this! It’s delicious. But I ended up with a ton of extra dough (I just roll out extra biscuits) I guess I could roll it out thicker than the 1/4″ mentioned in the recipe, but assuming that will affect the cooking time? Made this today for dinner. Everyone LOVED it! Thanks for a great recipe. Thanks Nicole for sharing the best chicken-pot-pie recipe I’ve ever tasted. The sherry really made this dish pop! I’ll admit, it isn’t something I’d make after a long day at the office, but it was kind of relaxing to prepare on a snowy Nebraska Saturday afternoon. My boy’s and I devoured every bit of it! Oh, and I took your advice for big eaters, I doubled the filling and used a deep 13×9 disposable foil pan. Perfect! This has become a Sunday staple in our house. We love it! So comforting. Question – how would you freeze it? Freeze the biscuits individually and apart from the filling? Then reassemble before popping it all in the over? Love to hear that! Hmmm. Yes, I would freeze them separately since you’ll want to defrost the filling, and then cook the biscuits frozen. Does that make sense? So defrost the filling, then top with frozen biscuits. They will probably take 20-25 minutes to cook, I’m guessing. Hope this helps! Have just finished putting this together, You have cooking time at 45minutes but you only talk about baking in a 400 degree oven for 15 mins till the biscuits are brown. Do I continue cooking this for 30 minutes at a lower heat? No, the cooking time listed is for ALL of the cooking, including cooking the veggies/making the sauce prior. You just want to cook the entire dish until the biscuits are cooked and the filling is hot! Seems I’m about 2 years late but I tried this today. The cheddar biscuits sold me. My first time ever making biscuits and they turned out amazing! The house smells so yummy and warm and I love that the instructions were so simple. (I didn’t have sherry) I would make extra soup/filling next time. Other than that, perfect.